Discourse ethics represents an exciting new development in neo-Kantian moral theory. William Rehg offers an insightful introduction to its complex theorization by its major proponent, Jürgen Habermas, and demonstrates how discourse ethics allows one to overcome the principal criticisms that have been leveled against neo-Kantianism. 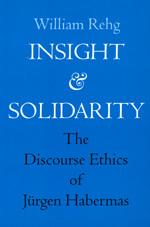 Addressing both "commun-itarian" critics who argue that universalist conceptions of justice sever moral deliberation from community traditions, and feminist advocates of the "ethics of care" who stress the moral significance of caring for other individuals, Rehg shows that discourse ethics combines impartiality with solidarity. He provides the first systematic reconstruction of Habermas's theory and explores its relationship to the work of such contemporary philosophers as Charles Taylor. His book articulates a bold alternative to the split between the "right" and the "good" in moral theory and will greatly interest philosophers, social and legal scholars, and political theorists. William Rehg is Assistant Professor of Philosophy at St. Louis University and the translator of Between Facts and Norms by Jürgen Habermas.